Arlington County has started installing the first of the 250 "wayfinding" signs it has planned for along the Rosslyn-Ballston corridor (as detailed here). 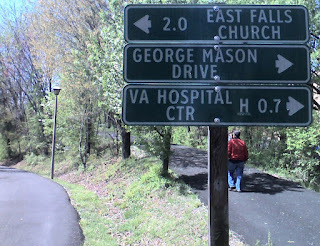 I have blogged on trail signs in the past--mostly negative, because they either tend to not exist or fail to function well. So it's great that these are finally going up. I'm sure I will have criticisms (see below), but signs of almost any kind are better than the absence of signs. So all in all, this is a great step forward. This one is mounted on the sound wall at the entrance of the trail It is excellent that the signs indicate the name of the trail. In the past, this has often been a problem. Signs would point towards destinations but would fail to tell you where you were. 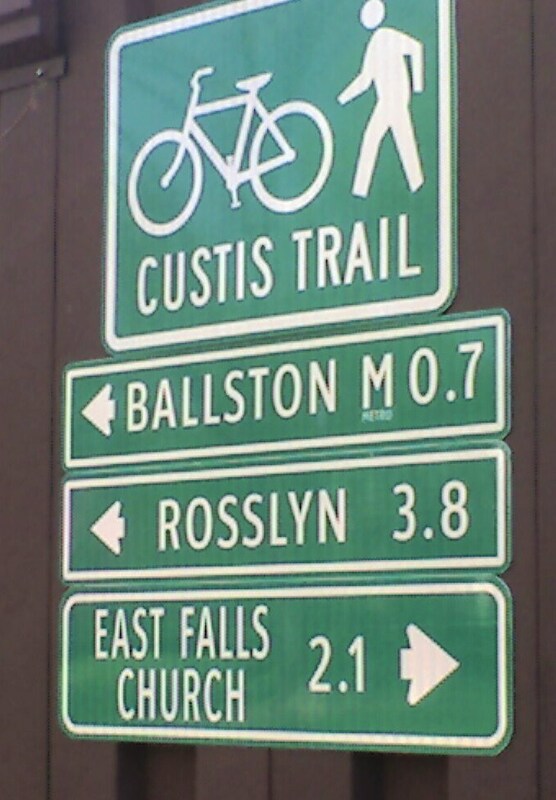 Now someone using Google Maps and given the direction "Turn Right on the Custis Trail" will have confidence they are in the right place when they reach the trail. 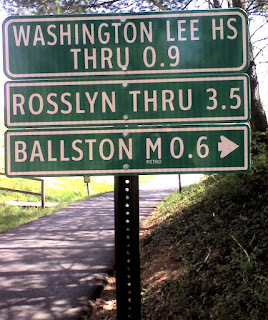 The East Falls Church distance indicator is swapped with the one on the sign below. This sign is actually closer to East Falls Church than the sign below, but indicates that it is farther away. This has always been a confusing spot, because both directions look like the trail. 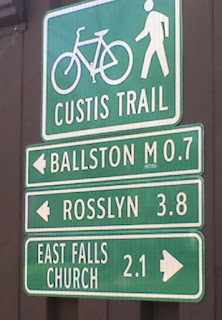 This sign helps, but would be better if it also indicated that the Custis Trail continues to the left. 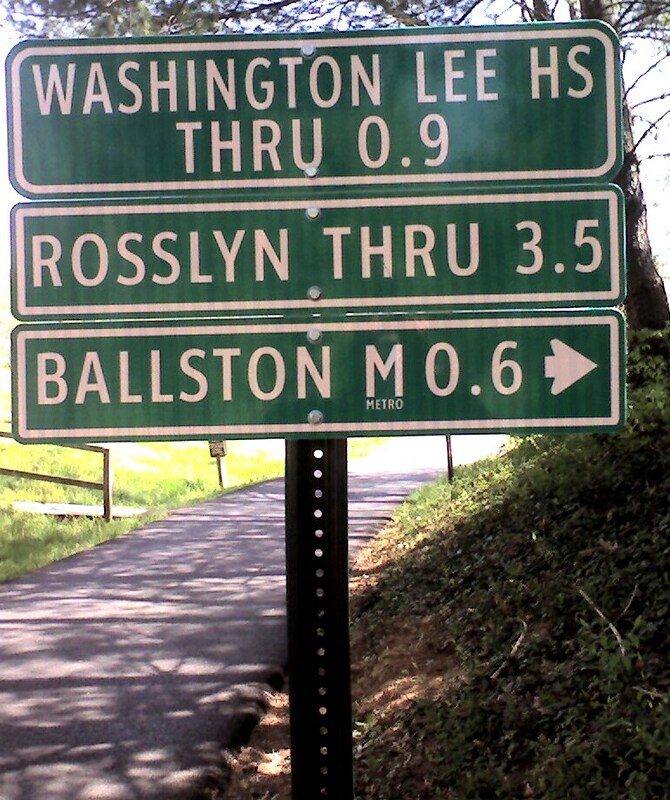 Also, as noted above, the distance to East Falls Church is inconsistent with the sign shown above. I don't like this sign for two reasons. First, the word "THRU" is a bit unclear. A straight arrow would be much clearer, and it would be more consistent with the directional arrows used elsewhere. I'm not sure what the difference between a straight arrow and the word "THRU" is supposed to be. If there is no difference, then they should use a single indicator. Second, what's with Washington Lee HS? That is not a useful destination for more than 99% of trail users and is a waste of a sign. Of all the cyclists and peds passing this point, I would guess fewer than 1% are going to W-L. On the other hand, probably more than 25% are going to Washington DC, yet I'm told by staff that Washington DC will appear on very few of the signs even though it is either the most common destination or at least among the top two or three. W-L HS is not even in the top 20. The signs for W-L should be at the connector to 15th St. N near N. Taylor and at the Quincy St. connector (the exit points from the trail to the school) and nowhere else. This sign should have a more general location like "Clarendon" or--better--Washington, DC! That's where everyone's going, after all. This brings me to one of my pet peeves. Arlington hired a supposedly top notch contractor to do this. They spent a lot of time and money developing a comprehensive plan. I'm active in the cycling community and I never heard hide nor hair from them. Should they not have been on the DC bike forum asking the community about challenging intersections and common destinations? Shouldn't they have shown up at the Bicycle Advisory Committee meetings seeking local knowledge? Shouldn't they have been out on the trails talking with the actual trail users to get their input? These seem like such simple and obvious information gathering tactics. Perhaps I'm wrong, but I'm not aware that they engaged local users at all other than the Arlington County staff. I have great respect for the staff, but they are just a few people. The Bike Advisory Committee has collectively decades of local experience that the contractor could have mined. I will keep my eye out for these signs as they are added and will publicize my opinions--good and bad--as we make progress.